2 Piece Sectional Sofa set in Faux Leather. 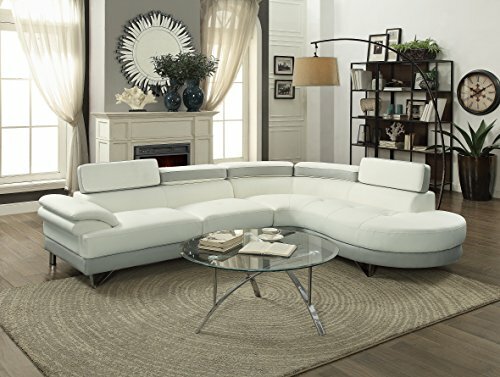 Color : White And Grey Set Includes : 2pc Sectional Sofa Only. Dimensions : Chaise : 85" x 38" x 29-34"H Sofa : 64" x 35" x 29"-34"H . Assembly : Simple Assembly Required. Shipping : Shipment will take around 3 to 12 business days. Shipping include : Curb Side delivery only, No inside home delivery. Description :- Take flight with this 2-piece sectional featuring a unit upholstered in a smooth faux leather with a wide seating are and two-paneled back cushion with adjustable headrests. Spruce the contemporary flavor in your home living space. If you have any questions about this product by Esofastore, contact us by completing and submitting the form below. If you are looking for a specif part number, please include it with your message.